Lonely Burials in a Forgotten Landscape? Marked on the Ordnance Survey map, but miles off the beaten track for most, these mysterious ancient mounds have a strange, enchanting appeal - especially when you visit them alone, as I did today. It's easy to be alone here. Swainstead Raike is an ancient old highway betwen high walls. You can sense it leading to something special. Gritsone erratics are scattered around the area, dropped by glaciers some 12,000 years ago as they made their way down onto the Craven Lowlands. 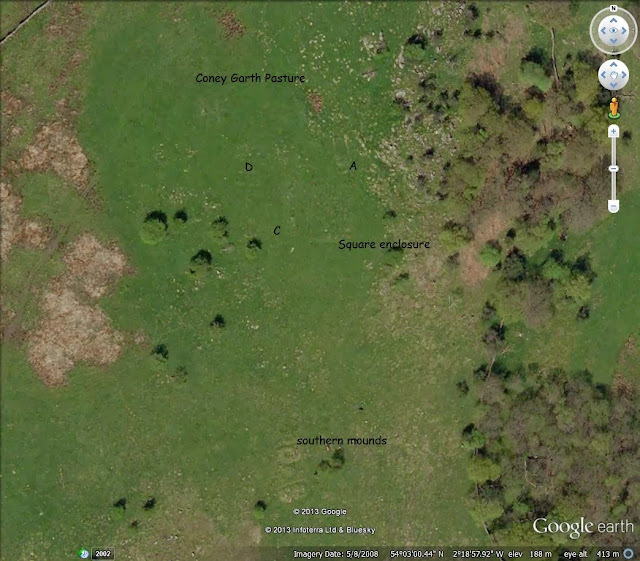 Coney Garth Pasture is marked by the obvious 'hump' in front, with a few scattered trees. Penyghent and Fountains Fell are in the background. The name literally means 'colonised hill' especially when referring to animals: in this case, rabbits. The pasture was once an extensive rabbit warren. Many of the recognised 'pillow mounds' in the country have been found to be artificial rabbit warrens from the Middle Ages. Yet those in Coney Garth contain tantalising evidence that they were used for other purposes - especially as charcoal and flints were found in the upper mound. To enter the pasture, head down to the trees on the extreme right, where a gate gives access to a footpath leaing to these very special archaeological sites. Some of the gritstone erratics are very impressive. The high country in the background marks the line of the South Craven Fault - and was once a huge shelf marking the barrier between shallow and deep water in a tropical sea. Looking to the woodland at the eastern extremity of Coney Garth Pasture, with Settle nestling under the Craven Fault zone in the distance. Entering the pasture ... and excitement begins to build. The lush grassland at the highest point of the pasture was chosen for this series of 'burial chambers', which have never been reliably dated. Speight, (1892) considers them to be 'probably of Celtic origin.' Are they, as the name suggests, simply man-made warrens? The first cairns encountered are this series of obvious 'burial mounds' or the 'E' mounds as labelled on a diagram by the Reverend Arthur Cross of Giggleswick School in the19th century. He was one of the first to explore these intriguing features. At least four burial mounds, aligned north east - south west - make up this southern complex. They vary in size with one smaller mound wedged between two larger examples. View of the southern complex looking north west, with a small mound just visible between a larger pair. Strange illusions can happen at places like this. The ditch surrounding one of the 'burial mounds' is on the left - and at centre, shades of the turf reveal an obvious skull which looked very eerie when viewed through a camera lens. Squint at the screen or move a few feet backwards and you can't miss it. The square enclosure on its plateau, clearly visible to the right of the hawthorn, and beneath the rocks of Coney Garth. Panoramic view of Mound 'B' - the square 'funeral' enclosure, with the ridge of the hearth visible in the centre - and the masssive burial mound 'C' running parallel to the main square on the right. The square enclosure from the south, looking to the summit of Coney Garth. It occupied a very prominent position on the outcrop. The longest and best preserved feature - Mound C - shown in the foreground running parallel to the square funeral enclosure (in the background). The limestone heights above Settle can be seen in the distance. The awesome mound C, looking south. It is over 30 yards long and is surrounded by a low ditch. Much effort obviously went into its construction. Mound C from the south - with the ditch clearly visible, though it is now much silted up. To the north of the square enclosure is this somewhat isolated cairn known as Mound A. It is 16 yards long and 5 yards wide. Excavations here revealed flints and scrapers, with evidence that it had been plundered many years before the 19th century. Charcoal was also present in this mound. Just above centre can be seen Mound D, with the huge Mound C running diagonally just left of centre. This is a fascinating complex of ancient features that repays several visits. Mound D, at the north-west of the group, is split into several distinct 'burial mounds' and surrounded by a shallow but obvious ditch. A final view of the spectacular southern complex, showing the small mound sandwiched between two others, and with a great view up the flat expanses of the Craven Lowlands. Looking from the top of Coney Garth to Giggleswick Scar and the great bulk of Penyghent. The scar is an exposure of the South Craven Fault and the line of the fault can be seen beneath the cliffs. The limestone along the fault line slipped down hundreds of feet and now lies far below the green fields in the foreground, when it was once a continuation of the clifftops towards the camera. What an earth movement that must have been!! The Ingleborough massif from the same position. You can never escape the master's presence - and no wonder the ancients chose this location.